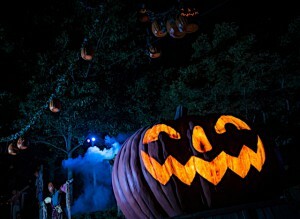 Frightful creatures have taken up residence at Busch Gardens® Williamsburg for Howl-O-Scream®. Buccaneers, vampires, fiery fiends, legendary villains and mythical beasts are waiting for the first guests to arrive Sept. 12. At the stroke of 6 p.m. on Friday, the ghouls and haunts come out to play and the park becomes a seriously scary place. Parents and guardians should consider the park’s elevated scare factor when deciding to visit Busch Gardens with young children during Howl-O-Scream. A curse has spread over Busch Gardens in the form of a song. The only way to lift it is to spend a night exploring Howl-O-Scream’s five Terror-tories™, including the new Wendigo Woods™ and six haunted houses. The park’s newest Terror-tory, Wendigo Woods, explores the frightful nature of the unknown through psychological scares that lets a guest’s imagination run wild. Other seasonal park offerings include a spooky lineup of shows, featuring Monster Stomp™ on Ripper Row® in the park’s Globe Theatre and Vampire Vogue™, a new merchandise shop in the Oktoberfest section of the park. Dining and spirit options like Pirate Baarrrgh™ in the park’s Italy village and Igor’s Fright Feast™ in Ireland provide a refreshing break from the chills and thrills. ACE Members can enjoy an informal get together at Howl-O-Scream on Saturday, August 20. We’ll ride roller coasters during the day and Howl-O-Scream (and roller coasters at night). Meet by the clock tower in front of The Globe Theater at 10:00 am on September 20. If you only want to come for Howl-O-Scream, you can catch up with the group at 4:00 in front of Apollo’s Chariot. If you want to catch up with the group at a different time, register, and there will be a contact number where you can reach the event organizer (Wesley Friend) To register, just like our Facebook Event Page or send a e-mail to acemidatlantic@yahoo.com.